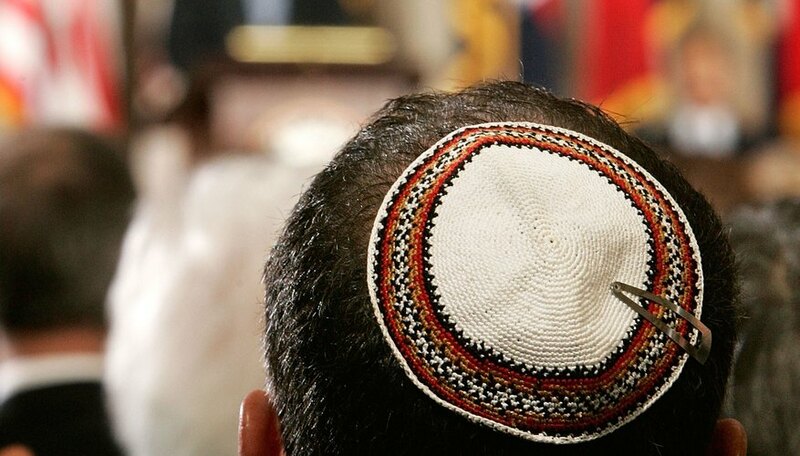 A kippah (also known as a "yarmulke" or a "skullcap") is worn by many Jewish males around the world as a symbol of respect for God and as a display of Jewish identity. Kippot (the plural of "kippah") come in many styles, and within Jewish subculture, the material, size and design of a kippah can represent shadings of belief and background. The most common type of kippah made by hobbyists is the crocheted kippah, popular among the Modern Orthodox and Zionist Jews, but you can also purchase leather or other fabric kippot and decorate them. Using DMC cotton #8 and a size 10 or 11 crochet needle, crochet six stitches and then join the last stitch to the first. 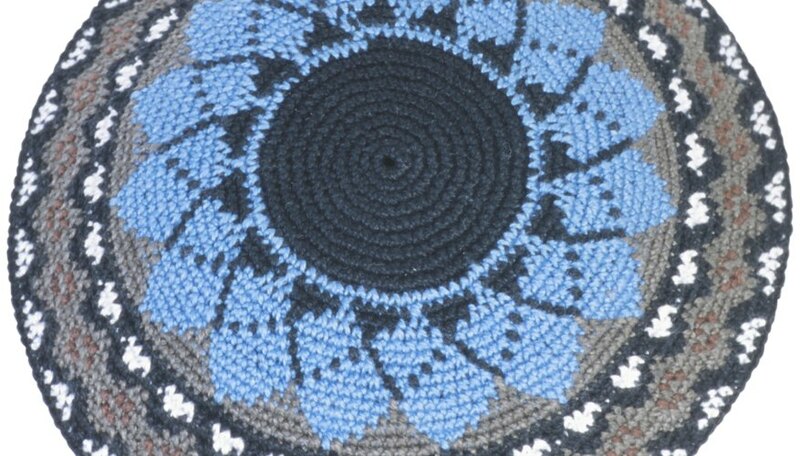 Begin crocheting in a circular, spiral pattern. To make the top of the kippah flat or dome-shaped, rather than tubular, "increase" as you go along, putting double stitches into some of the holes so that the circumference of the circle grows larger and larger. A good rule of thumb is that you should increase in proportion to the number of rows you have made, counting from the middle of the circle. Thus, if you are on row three, increase (make a double stitch) every third stitch. On row eight, increase every eighth row. This is just a general rule; as you crochet, check your work every so often. If the kippah is wavy, increase less. If it is sloping too much, increase more. When the kippah is the size you want, knot the last stitch and thread the end into the underside of the kippah so it won't show. It is common to crochet a pattern around the outside of a kippah. You can find patterns online, buy pattern books at Judaica stores or design your own on graph paper. Often, people crochet the name of the wearer into the kippah's rim. 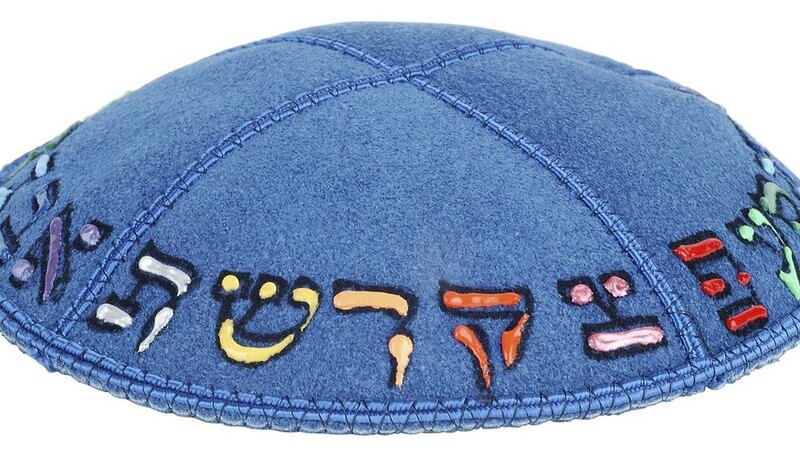 A blue border on an otherwise white yarmulke is a hallmark of the religious Zionist, while Modern Orthodox teenagers often favor whimsical designs such as a yellow kippah with a black smiley face or a watermelon kippah with black "seeds" and a green rim. If you are making a kippah for someone who is Modern Orthodox but leans toward Ultra-Orthodox beliefs, an all-black crocheted kippah, or a black one with a simple border design, will be safe. To crochet a design into your kippah, "pick up" the second color according to the design specifics. A few stitches before you start a new color, crochet it inside the base color to avoid loose threads, and crochet it inside the base again, for a few stitches, when you are done with it. Many Ultra-Orthodox men prefer black velvet kippahs over crocheted ones. You can sew your own, but a simpler way to personalize a velvet kippah is to purchase a plain one in a Judaica store and embroider it yourself. Popular designs for velvet kippahs include the wearer's name (not too prominent), flowers, Biblical verses and the Jerusalem skyline. 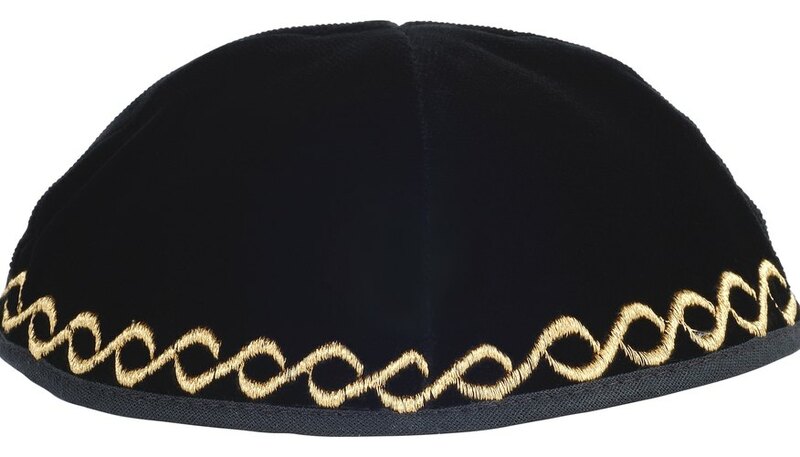 There are two populations who favor suede kippahs: little boys (because suede can be decorated with puff paint) and Modern Orthodox men, who wear them in plain black. You can sew your own suede kippah or buy them undecorated at a Judaica store and decorate them yourself. For a child, use puff paint to draw a colorful design, the wearer's favorite cartoon character or the logo of his favorite sports team. The Bukharan Jews, from what is now Uzbekistan and Tajikistan, brought a distinctive style of kippah to Israel which is now also favored among hippie-style Jews (because the kippah is large and colorful) and small children (because the kippah stays on without any clips or pins). To crochet a Bukharan kippah, make a larger-than-usual circle, big enough to cover the head, and then crochet several rows without increasing. Use colorful threads, including gold. Sarah Bronson received her Master of Arts in journalism from New York University in 2002. Since then her clients have included "The New York Times," "Glamour," "Executive Travel," "Fodor's," "The Jerusalem Report," "ESPN—The Magazine," the "Washington Times" and "Figure" magazine. Her areas of expertise include biotechnology, health, education, travel, Judaism and fashion. What Are the Differences Between the 10, 20 and 30 Crochet Threads?